Look for this sign at your participating Neighboring Food Co-op to find this month's delicious, specially-priced "Cave to Co-op" regional artisan cheese. Miles south of Boston, Great Hill Dairy in Marion is known for its outstanding herd of Guernsey cows as well as its prize winning Acacia and Orchid collections. Great Hill also produces a unique and delicious blue cheese that is made in the Dairy’s turn-of-the-century barn. The farm has been in the Stone family since the early 1900s. Great Hill Blue is an internally ripened blue hand made with raw, unhomogenized milk resulting in a cheese that has a dense yellow curd and a full flavored rich smooth taste. 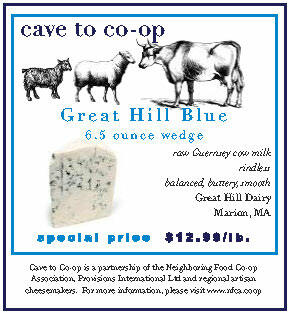 Great Hill Blue is creamy and moist with a good crumb and a buttery robust flavor that is refreshing yet balanced. Great Hill Blue has been recognized with numerous awards, including first place in the 1999 & 2008 American Cheese Society annual judging, a finalist in the 1999 Fancy Food Show and blue ribbon recipient in the 2001 World Cheese Championship. Great Hill Blue is a dense, creamy, and versatile blue cheese that is equally delicious as a table cheese or in cooking. It is somewhat milder than most blue cheese, but still has a delightful tang and can be crumbled on salads, served with fresh fruit as a dessert, added to your favorite popover recipe, used to top a burger or grilled in a sandwich with caramelized onions. Here are a few recipes, courtesy of Great Hill Blue and Provisions International. In a saucepan, sauté carrots, celery and onion in butter until tender. Blend in flour. Gradually blend in milk and cream cheese until smooth. Add broth, blue cheese, and parsley. Stir until blended. Heat and serve hot. Pound chicken to ¼ inch thickness. Sauté onion in 2 tablespoons butter until tender. Add spinach; cook just to remove moisture. Add crumbs, cheese and lemon juice. Put 1/4 cup of mixture on each chicken piece. Fold in sides, roll, and skewer or tie. Coat the chicken pieces in flour and brown in remaining butter. Place in an 11x7x1 ½ inch baking dish. Add broth, wine, and salt to drippings in skillet. Heat; pour over chicken. Cover; bake in a 350-degree oven 35 minutes. Uncover, sprinkle with paprika. Bake 10 to 15 minutes. Stir juice in pan to blend. If juice is thin, remove chicken pieces and keep warm. Reduce juice over high heat while stirring, until thickened. Serve. Preheat oven to 500° F with rimmed baking sheet on rack. Cut each pear in half, core and slice each half into four slices. Mix together melted butter and sugar. Toss pear slices in this mixture and place on hot baking sheet in single layer. Roast until caramelized and brown, about 10 minutes. Watch carefully so the pears do not burn. Remove from oven and cool. Whisk together olive oil and vinegar. Add salt and pepper to taste. Toss the arugula and red onion with the vinaigrette and divide between four plates. Arrange the roasted pears on the greens, crumble the Great Hill Blue and divide among the plates and top with the toasted nuts. Place cheese, walnuts, green onions, parsley and lemon zest in a bowl and mix well. The relish can be made one day ahead. Cover and refrigerate; bring to room temperature 30 minutes before serving. Serve with grilled meat, vegetables, as a topping for grilled bread, or as a stuffing for vegetables. This makes a wonderful appetizer spooned into individual endive leaves and topped with dill. "Cave to Co-op" is a partnership between Provisions International and the Neighboring Food Co-op Association (NFCA) to support local, artisanal cheese producers in our region and make their products more easily available to co-op shoppers. The NFCA is a network of more than 30 food co-ops in our region that are working together to advance their vision of a thriving region economy, rooted in a healthy, just and sustainable food system and a vibrant community of co-operative enterprise. To find a Neighboring Food Co-op near you, please visit www.nfca.coop/members.